In a post from last week, I talked about some of the shortcomings of Site Overlay. If understanding what visitors click on on your site is interesting to you, but Site Overlay doesn’t quite fit the bill, here are a couple of alternative recommendations. CrazyEgg is a tool that’s designed to track what visitors click on. It will give you an overlay view similar to Google Analytics’ Site Overlay, as well as heatmap and “confetti” views showing where users clicked. The heatmap shows a “hot and cold” overview of the page, shading from blue to red, while the confetti viewYou can also get a list view of the raw data that can be exported into a spreadsheet. CrazyEgg used to offer a limited free plan, but unfortunately, they seem to have nixed that. Pricing starts at $9/month and is based on the number of visits and pages you want to be able to track. ClickTale is another tool for tracking how visitors interact with a page, and it does some really cool things. It basically records all the mouse movements a visitor executes on your pages. Then it takes that data and provides reports that tell you things like where people hover, how many of them eventually click, where do they hesitate, and so on. It can show you things like how far down the page visitors tend to scroll, and how many fields in a form visitors fill out, whether they skip some fields, hesitate, etc. And you can even watch recordings of interaction — kind of like an informal, no-audio user test of your site. Here’s an example of a question about a website that only using a tool like one of these could help answer. 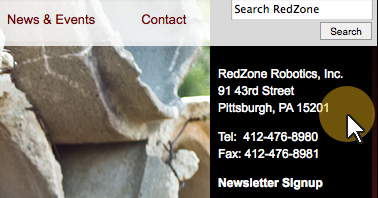 RedZone Robotics was interested in visitor behavior on their Contact Us page. The page includes a form to submit contact information and a lookup of sales representatives’ contact information based on your geographic region — both of which are tracked by goals in Google Analytics. But we were interested in people who abandoned the page without completing either of these goals. We installed ClickTale to use its form analytics reports to see if we could understand what was going on — maybe people were turned off by filling in one of the form fields, for example. What we found turned out to be entirely a surprise. People weren’t filling out the form, but when we watched the video, what we saw was the following? They highlighted the phone number and clicked — they were copying and pasting the phone number from the site! The Contact Us page was a gateway to leads that came in via telephone, in a way we couldn’t have measured without a tool like ClickTale.